Just wondering… Was Bumper Bike Guy way ahead of the curve on this one? Is he still around? Haven’t seen him in years. These two IEEE Spectrum articles are identical except for the title. By the way, if Uber etc want more training data of cyclists biking near cars, they should ask the Pittsburgh cyclist community for volunteers. I know I read a very recent account of an encounter with Bumper Bike guy within the last couple of weeks. I’ve seen Bumper Bike a couple of times in the past few months, in Homewood. It might be that his range shrinks in the winter. This reply was modified 2 years, 1 month ago by Eric. Aw, whatcha guys actin’ all so uptight about? Did you guys see the results of our AV survey? Honestly, i was pretty surprised by them. Our membership is much more accepting of them than the general public. Ready for driverless cars? A $1 billion investment by Ford Motor Co. in Argo AI a startup founded by CMU alumni and former staff members may change the way you drive. Like most technologies, AVs have the potential to be used for good or for evil, same as nuclear power, guns, computers, etc. A lot depends on laws and law enforcement. With tight controls, we could see AVs operating in a safe and conservative manner that makes them safer than most cars are today. If society chose to, they could be forbidden from ever exceeding 25 mph, for example, and restricted to roads approved for AVs. But this is very unlikely to happen. With lax controls, on the other hand, we could create a market for software (legal or illegal) that would drive AVs anywhere at all, on- or off-road, in an extremely aggressive manner, like Grand Theft Auto. Remember how, in the early days of the internet (1993, say), many thought the internet and the web would be great democratizing forces that would empower the little guy? We have positive consequences of that today (Wikipedia, blogging, text messaging, …) but we also have many negatives (spam, ubiquitous advertising, worldwide NSA surveillance…). Let’s learn some lessons. We need tight regulation. My feeling is that one of (if not) the biggest “driver” will be the responsibility/insurance” issue for accidents/crashes, etc.. And that hasn’t been fully navigated yet. Hope this will happen even sooner so that we will have more bike lanes! It seems possible that the rise of on-demand car services like Uber (and the lower Uber prices that could eventually result from driverless cars) would encourage mass transit, because fewer people would need to own cars. If you own a car, you’ve got fixed costs like the purchase price, insurance, and so forth. It makes sense financially to use the car as much as possible to spread out those fixed costs. But in the on-demand model, those costs are included into its pay-per-use system. You get zero fixed costs but higher per-use costs. Pay $3000 a year for a car (purchase, insurance, repairs). Pay $250 for 250 commutes by car at $1 each (gas, wear). Pay $50 for 50 other trips by car at $1 each. Total $3300. Pay $3000 a year for a car. Pay $1250 for 250 bus commutes at $5 each. Pay $50 for 50 other trips by car at $1 each. Total $4300. No car. Pay $1250 for 250 bus commutes at $5 each. Pay $500 for 50 trips via Uber where the bus doesn’t go, at $10 each. Total $1750. There’s no financial incentive to pick 2 over 1, but a big financial incentive to pick 3. Yet 3 is only possible when you have reliable, convenient, inexpensive Uber/Lyft/Zipcar/taxi service for every trip where you can’t use transit. So perhaps better on-demand car service will lead to more car-free people who take transit on most trips. “Pittsburgh Welcomed Uber’s Driverless Car Experiment. Not Anymore. @steven, agree with your assessment. Taking public transit to work made no financial sense to me when I had a car. I would spend roughly the same amount of money on transit fare for commuting to work only than I would spend the whole year on gas for my car. I didn’t have to pay for parking at work, so there would not have been any savings there. The only benefits would have been perhaps a less-aggravating commute and I guess some environmental benefits, but that’s about it. The true cost savings came from getting rid of the vehicle entirely. Also, having Uber/Lyft available had a significant influence in my decision to go car-less two years ago. Public transportation and cycling have their limits (the latter particularly if it’s late at night and/or you’ve been drinking) and it’s nice to know that it will be very unlikely that you’ll be SOL if public transit or cycling aren’t realistic options. @chrishent — that’s because the true cost of commuting via car isn’t baked into the out of pocket cost — the cost to the environment, the cost of building roads, etc. It is a tragedy of the commons type of situation. A carbon tax would go a long way toward making the cost of commuting via car more clearly reflect the costs to society at large. Will cars of the future enforce the speed limit? To be more precise: In 5 or 10 years, when new cars will have enough sensors in them to know what road they’re on (with more certainty than current navigation systems do), and most high-end cars have an autonomous driving mode, will cars look up a road’s speed limit from the official database, and then enforce that speed limit? I’m imagining that if the driver tries to drive over the speed limit, the car beeps at you and refuses to go faster. When you google “speed governor”, you see more selfish comments by people howling about the frustration of not being able to drive 130 mph than wise comments by people noting that many lives would be saved if all cars had sensibly-set speed governors. The rationalizations for extreme speeding get pretty far-fetched: you never know when you might need to outrun a tsunami or a tornado… The craving for speed is so strong that you can bet there will be strong demand for aftermarket engine computer reprogramming to defeat sensibly-set governors. I wish we were, but I’m skeptical that our society has the wisdom to embrace sensible speed governors. People, including cyclists, are rear-ending self-driving cars in San Francisco when they stop short to avoid accidents. I was a bit taken aback to see a very familiar location as the top photo in that story. So it was going faster than the speed limit. Sure it was only three MPH, but these things are PROGRAMED to ignore RULES. That was my first thought as well – how is it possible the car was speeding? And why so much victim-blaming (“Moir also faulted Herzberg for crossing the street outside a crosswalk. ‘It is dangerous to cross roadways in the evening hour when well-illuminated, managed crosswalks are available,’ she said.” https://www.theverge.com/2018/3/20/17142672/uber-deadly-self-driving-car-crash-fault-police) when the vehicle was driving over the speed limit? The article I linked states that the speed limit may have changed somewhat recently – google streetview shows the speed limit as 45 in July. AVs need to be up-to-date on traffic laws. 3 mph is very significant when it is between 30-40 mph per the literature on car speeds and peds deaths. looks like the death rate goes from 40 -> 80% when cars go from 30 -> 40 mph. Hmmm I always assumed the vehicles were programmed to know the speed limit of a road, not reading signs. But now that I’ve read about it, that is apparently not the case. “Moir also faulted Herzberg for crossing the street outside a crosswalk. ‘It is dangerous to cross roadways in the evening hour when well-illuminated, managed crosswalks are available,’ she said. Well, at least she didn’t go on to point out that Moir should have been wearing a helmet. Last Saturday I was driving down Liberty to the Strip. At around the brewery there’s that detour around some (non-existent) construction. You know, the one where all the lines were repainted, including the bike lane (which lines have disappeared by now). Anyway, that spot narrows the roadway by a lane or so and drivers mostly sense that they should slow down. That morning I encountered an auto-Uber barreling through the bottleneck at high speed. It was a bit scary (a human driver would likely have slowed down, as a gesture to the oncoming driver). I wonder if the smart-car was simply going with a speed limit from the database. 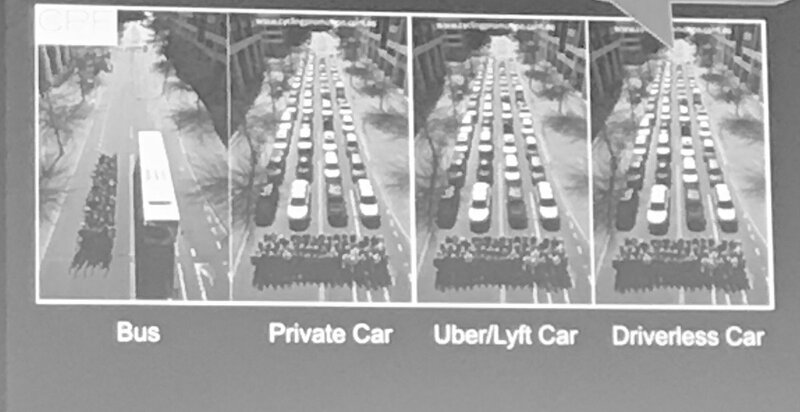 More dismaying, the possibility that Uber’s modeling focuses just on street observables and ignores an explicit driver behavior model. I see the Argos quite a lot. They seem to do the River Ave loop over and over and over again. If they’re mostly on River, they have a long way to go (so to speak). NY Times has more information about the crash. tl;dr — woman crossed in middle of intersection with bike. car was going 40 mph in 45 mph zone. Timothy Carone, an associate teaching professor specializing in autonomous systems at the University of Notre Dame, said fatal crashes involving autonomous vehicles, while tragic, will become more commonplace as testing is introduced and further expanded. Road testing is the only way the systems can learn and adjust to their environments, eventually reaching a level of safety that cuts down on the number of motor vehicle deaths overall, he said. Aren’t the sensors supposed to pick up ‘obstacles’ even in the dark? Yes. The question is whether it was quick enough to stop the car if the reported scenario (person walked out in front of the vehicle) occured. It obviously wasn’t. The car should also scan360 for obstacles. That’s how it looks for bikes. But maybe the person was obscured by shrubs/trees/infrastructure on the side of the road or maybe the car was programmed to ” think” that this was a person on the side of the road and that people on the side of the road don’t suddenly enter into traffic. Ie people on a sidewalk. Lots of moving parts. A tragic loss of life. The person in the car, I’m sure, feels a tremendous sense of guikt too. This proves the thinking in the safety community that when there’s a crash there’s not just one thing that goes wrong but many. It’s hard to see the driver looking down as “something going wrong” when it’s entirely predictable from human factors research that is at least 50 years old and the internal monitoring of the drivers would have shown it happening constantly. People just can’t be expected to pay attention to a task where they’re not needed 99% of the time. We just don’t work that way. It’s as foolish as designing a task that requires people to lift 500 pounds. So this looks like a classic case of inattentive driver, driving too fast. In addition to the questions about Uber’s software and hardware, it also points out the dangers of bad urban design: poor pedestrian and cyclist network, excessively wide roads that encourage speeding, wide median pathway that invite pedestrians to cross the road in an unsafe location, all-around pedestrian-hostile design. “Tempe Police Chief Sylvia Moir told The Arizona Republic on Tuesday the crash was “unavoidable” based on an initial police investigation and a review of the video. … “It’s very clear it would have been difficult to avoid this collision in any kind of mode (autonomous or human-driven) based on how she came from the shadows right into the roadway,” Moir also told the San Francisco Chronicle after viewing the footage.” Isn’t that what headlights and LIDAR are for? Interesting article / opinion piece about the Uber crash.